It is a curiosity that the Netherlands never produced any fiction or drama in the vernacular that took its place alongside that of the other languages of Western Europe, such as German, French, Italian and English. The greatest writers of the Dutch Golden Age were Spinoza and Grotius, both of whom wrote in Latin, as had Erasmus, the great Rotterdam humanist of a previous century. Rather, as everyone acknowledges, the greatness of Dutch culture rests on its paintings, which provide a vivid and even a metaphysical insight into the life of the Netherlands in the Seventeenth Century. The Metropolitan Museum of Art in New York is currently showing a rather large overview of these paintings and is avoiding the usual show of greats, including only a few by Rembrandt, one Vermeer, and none by Brueghel. The show provides a deep sense of why Dutch art is so good as well as so informative about the period it captures. Consider two portraits by Gerard ter Borch the Younger, one of a man and one of a woman, which are very similar to one another in composition and technique. Both the portrait of Margaretha van Haexbergen and “Burgomaster Jan van Duren” show the persons in very undecorated settings. They are each dressed in the appropriate business suits of their day: all in black, with a small ruff of white, his clothing not at all covering up his girth. There is a table in a rich and warm and interesting color to his right and there is an upholstered chair in a rich and warm and interesting color to her left. That is all. But think of the other and subtle ways in which the pictures capture the attention of a viewer. The faces, though expressionless, are done with a photographic realism, thin but hardlined boundaries for the face and the features, neither of the faces, however, particularly memorable. What is noteworthy is the placement of those portrayed in the painterly environment which are blank walls, only a difference in shading telling where the back wall ends and the floor begins. The figures stand out, as if in Three-D, the viewer sensing a space between the person portrayed and the wall behind them, that not seen region indicated by the lighting and the color of the back wall. So painterly skills allow the artist to present these people as presences, as solidly taking up their places in the world, whether that is interpreted as the social world or as the metaphysical world of being a being, all without the artifacts that are used for such purposes by Vermeer and others: maps and paintings on the wall, room furnishings, or simply the rendering of the prettiness of the subject. These two pictures are not busy at all and so are a rejection of what most of portraiture would seem to require to make its subjects of importance. They are individual because of the care with which their faces are done, but are also representative of a type without the appurtenances that establish the type. One would be hard pressed to find another artist who is so good at simplicity in his portraits until you get to Picasso who accomplishes this effect by the opposite of being realistic, choosing instead to limit his lines so as to make his figures legendary or else combines perspectives so as to make his portraits mythic. The same photographic realism is present in Emanuel de Witte’s “Interior of the Oude Kirke, Delft”, which portrays the interior of a church. As in much photography, the effects are created by deft cropping and the selection of the angle at which the picture is taken (or, in this case, composed). We are looking down but from not much of an angle so as to see two people in conversation in the chambers of the church that are far from the altar but close to a pulpit from which, presumably, a clergyman can address a crowd that is standing around him rather than sitting in pews The picture does not at all show the outside facade of the church, and so t two major ways in which a church reveals its holiness and majesty are not invoked. All one sees is some of the pillars that hold up the church and it is a stretch to say that those vertical features are invocations of the infinite. To the contrary, the God who resides in this church is invisible, the sanctuary known as such only to people who believe at much, and so is truly a Protestant Church rather than a Catholic Church, whose decoration and structure, images of the Holy Family and the saints everywhere, would make clear that the supernatural world is not very distant from the ordinary world. Photography also uses atmosphere to create its effects. That is done by the graininess of the black and white or the extent to which color is shiny rather than muted. 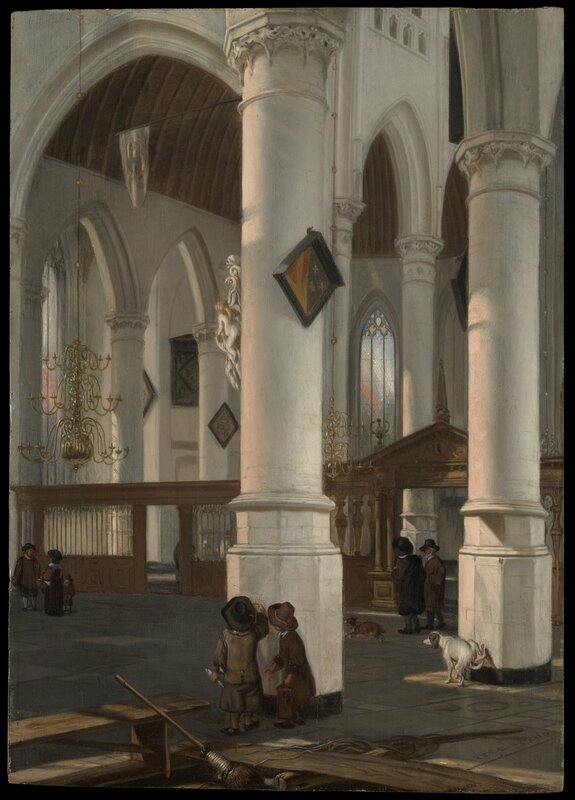 This attention to atmosphere is provided in this picture by the use of numerous shades of white in the painting of the church features. Even a good reproduction is not likely to capture the many shades of white that are present in the original that is on view at the Met, and shows why you still need to see the originals. De Witte is masterful in his whites, using them to depict shadows and also the worn or battered sides of the columns because people had leaned against them, just as ter Borch was masterful in presenting a rich though muted color scheme. So many of the Dutch, including Vermeer, of course, had a tremendous sense of color and the technical ability to make the paints that they needed. So many secular genres are available in this exhibition-- landscapes, battle scenes, commerce, scenes of everyday life-- that one forgets that these are crowding out the painting of the Christian story as the prime subject matter of painting, even as that had continued to hold its ground as the object of painting in the south of France and in Italy, the Christian story crowded out, as well, by paintings drawn from myths, which is what Poussin was doing at much the same time. The focus on everyday life is accomplished remarkably well by the still lifes, which are the ornamental arrangement of the food that would be presented to diners, the painting of which is done in a very non-photographic style. Artists dwell on the way feathers contrast with the bodies of the game that is to be eaten and how intricate are the contrasts of color and texture that show off an artist’s skill. Or, at least, that is the way those pictures are usually interpreted. Think of them, instead, as evidence of the life habits of the people who live in these towns, villages and cities, just the way a paleontologist can look at the stomach remains of very, very old corpses so as to see whether they digested seed or bone. Here we have evidence of a various diet heavy on fat that might indeed account for the girth of Burgomaster van Duren. The Dutch ate well or, perhaps, by today’s standards, too well. A particularly well executed presentation of the lavishness of good dining is Abraham van Beyeren’s “Still Life with Lobster and Fruit”. It makes sense that the Dutch would have lobsters, just as in another painting it makes sense for them to have oysters, two ubiquitous creatures to a society living by the sea. But the van Beyeren also includes grapes and a melon and a partly peeled lemon that show off the artist’s ability to use numerous colors close by one another and to reveal the innards of fruit rather than just their glossy skins. But the point to be made is that only a trading nation which has a lot of surplus could supply such exotic fruits for its domestic table, just as numerous paintings demonstrate that the dressing tables of young bourgeois women are well appointed with luxury goods. What accounts for the combination of spirituality, moral rectitude, family values and material splendor that was present in the Netherlands during the Dutch Golden Age? The hundred year old thesis of Max Weber, however much challenged, still seems to make the most sense to me. It was Protestant spirituality that, at the least, intensified the materialist and capitalist underpinnings of the society. That was because material affluence showed that you were among the saved and so could happily enjoy the fruits of your labor even as a prudish and non aristocratic reserve led you to invest most of your profits back in the business. Enough was enough; no castles, as in Spain, for the truly wealthy. A more modest explanation is supplied by Simon Schama in “The Embarrassment of Riches”. As his title indicates, the Lowlanders, who had built themselves up as a trading nation long independant because of their need to reclaim their own land from the sea rather than from a feudal master, had to cope with the meaning of just how well off they were, and art, philosophy and religion supplied that explanation as, I might add, it does to every wealthy population. The American Gilded Age also enjoyed its portraitists, such as John Singer Sargent, and even its presiding deity, Mark Twain, however much he also tweaked the noses of the rich while collecting his large lecture fees. What we have from the Dutch Golden Age are cultural achievements for which we can all still remain grateful, and grateful as well for the new, modern, sense of luxury. An individual found and expressed his individuality through his consumption patterns, what he chose to spend money on, rather than using his wealth to embellish his already established social station. A Dutch burger made himself up out of whether to buy fruit or fish or art or decorations for his house. He is, in that sense, a self-made man.